NEWS March, 2019: March 5th was the 2nd Jay Day. We Buy Wacky Packages Estates. Fair Assessments and Top Dollar Paid. Contact greg@wackypackages.org or call 267-243-6111. There's a 2nd Edition Too! 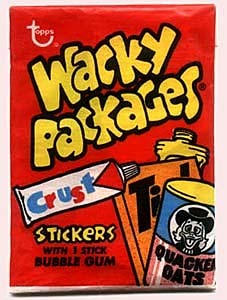 Stickers of Wacky Pack Boxes - cool new underground project. * All text on this domain copyright Greg Grant © 2000-2009, unless otherwise specified. * All images on this domain: no opinion as long as you don't use them for your ebay auctions without saying so or use them to build a competing website. Note that Topps is the copyright holder of all images, so if you make too much profit from the images Topps may have an opinion - they don't seem to mind some projects on Wackys, e.g. this site, but there is no guarantee, particularly if you make printed or tangible items. This site has had no dialog with Topps on this matter, and is not affiliated with Topps in any way.